Be the first to share your favorite memory, photo or story of Lily. This memorial page is dedicated for family, friends and future generations to celebrate the life of their loved one. Lily Esartia, née Partskhaladze, of Atlanta, passed away at home surrounded by family on January 21, 2019. Lily was born January 9th, 1926 in Gagra. Orphaned at an early age, she spent her teenage years in Tbilisi, and later she settled back in Gagra where she met and married Tariel Esartia. They raised two boys David and Plato, while Lily finished her pharmaceutical degree. Lily often accompanied Tariel on his work trips and together they have crossed the equator a few times. Although Lily was more of a homebody, she had fond memories of those trips. Her favorite stories came from visiting Madagascar as she was quite fascinated by the island and the animals, specifically the giant turtles that inhabit the island. In 1991, Lily and her family had to escape from Gagra and the family home, during Russian invasion of Georgia. Lily and Tariel ended up immigrating to United States and settling in Atlanta a few years later. 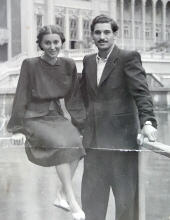 They were never able to return to their home in Gagra. The couple took to American life style immediately and after taking English lesson classes and passing their citizenship test, they were proud to call themselves Americans. They lived close to their son Plato and their three grandchildren. When the grandchildren moved across country for school, Lily and Tariel would often send them care packages with Georgian traditional foods they prepared themselves. Lily was a warm and loving grandmother. She loved spending time with her three grandchildren, and was very fond of the fourth furry one on four legs. She loved singing around the house and when her hands didn’t give her trouble, she played the piano. She enjoyed entertaining guests and appreciated time spent with her loved ones. Lily was known for her optimism and her sweet smile. She loved to tell anecdotal stories about her children and her grandchildren. She will be sorely missed by all that knew and loved her. Lily was the beloved wife and partner of the late Tariel Esarta, loving mother to David and Plato Esartia, devoted grandmother “Bebe” to Khatia, Natia and Christopher Esartia. Family and friends will gather from 11:00 am - 12:00 pm, Saturday, January 26, 2019 at A.S. Turner and Sons Funeral Home, 2773 N. Decatur, GA 30033. The service will start at 12:00 pm in the chapel. The burial ceremony is being held after the services at the Decatur Cemetery, on 299 Bell Street, Decatur GA 30030. To send flowers or a remembrance gift to the family of Lily Esartia, please visit our Tribute Store. Meet at cemetery after the service. "Email Address" would like to share the life celebration of Lily Esartia. Click on the "link" to go to share a favorite memory or leave a condolence message for the family.